The increasing student-faculty ratio continues to raise concerns about the quality of instruction students receive in the classroom. The student-faculty ratio has gone up from 18:1 to 24:1 since 1996. “The impact of faculty on the increase student-faculty ratio happens in two ways. One is the class size will get bigger and the other is they’ll teach more classes,” said Dr. Donna Llewellyn, Associate Vice Provost for Learning Excellence and Director of the Center for the Enhancement of Teaching and Learning (CETL). According to data from the Department of Institutional Research and Planning, the number of classes containing less than 40 students decreased by 43, while the number of classes containing over 40 students increased by 46 since 2006. 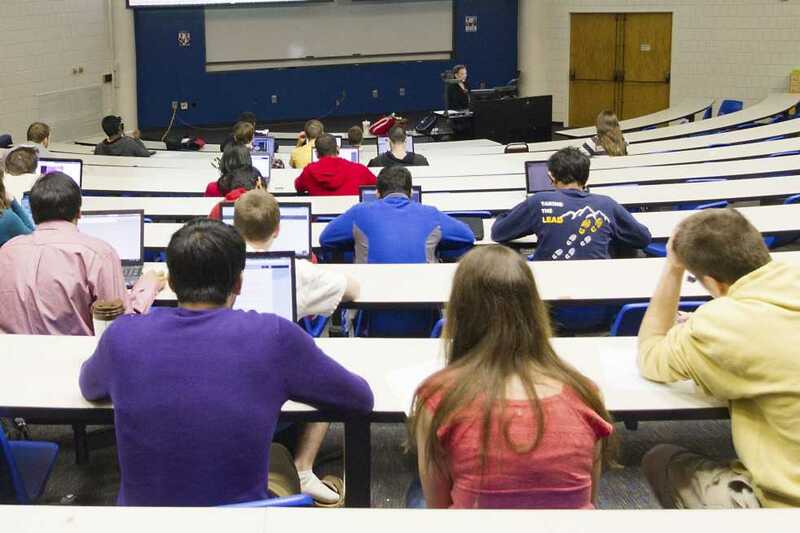 Potts observed that the faculty must change their curriculum to accommodate the larger class sizes. Departments across campus are trying to combat this trend through a variety of methods. Notably, technology has allowed the creation of these more conducive environments for learning. “When I first heard about [PRS] clickers, I thought, ‘Well, what a stupid dehumanizing technique that is, you go to class, you’re not even talking now, you’re just pressing buttons. It’s like a TV remote control’,” Potts said. However, Potts acknowledged how the Responseware systems could be effectively used. Other, more innovative approaches to conquer this higher SFR have been the implementation of problem-based learning (PBL) in engineering courses and the use of Twitter in one management class. Problem-based learning, an approach used in medical school education, has been gaining momentum in engineering classes. “The content delivery is done outside and the hard work is done inside,” Llewellyn said. “It has worked out extremely well. Students are very actively engaged – I have two of my grad students in the classroom with me, when the students raise their hand, we’re able to give them immediate feedback. It allows us to give them almost 1-on-1 tutoring in a classroom setting,” Webster said. Students in the classroom also expressed appreciation for PBL. “Student feedback has been far better than I imagined,” Webster said. “It has been overwhelmingly positive…Uniformly, they said they prefer because they have more control, if they miss a comment or miss a point, they can back it up very easily watch it again. Management Professor of Practice Bill Todd, in his case-based Management 3150 class, faced the dilemma of limited classroom time for discussion. These concerns and an ever-growing size in the class’s section forced him to pioneer an innovative method of fostering discussion in the classroom — through the use of Twitter. Ultimately, whether or not these innovations can serve as permanent solutions to the rising ratio is unclear. “I do fear we’re very close to the breaking point, if we’re not already there,” Jacobs said.